This year’s UCAN Perform Festival was enjoyed by over 180 visually impaired children and young people and their friends and family from across Wales and the South West of England. The festival was kindly hosted by the Wales Millennium Centre and participants traveled from as far as Anglesey and Pwllheli to attend. 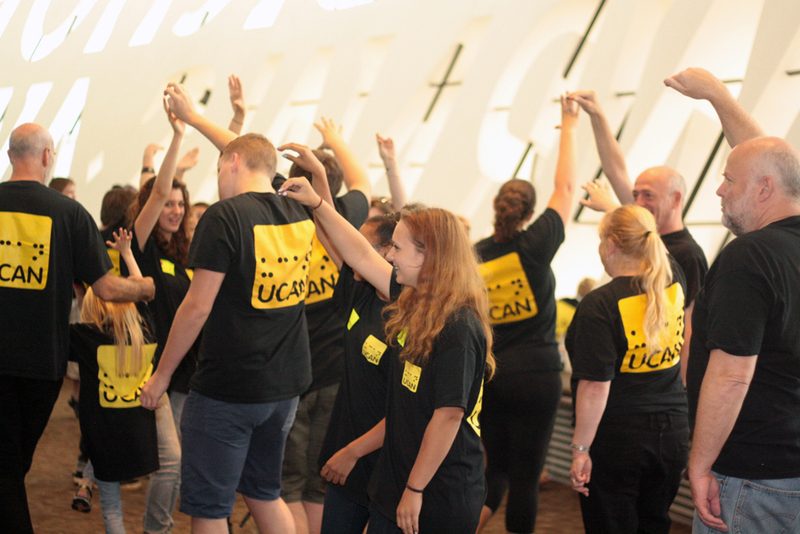 UCAN Trainers were for the first time supported by our UCAN Lead graduates, who have successfully completed a year long level 1 drama workshop leader training programme. A variety of workshops were run throughout the day, including drama and ukulele workshops, jewellery making, circus skills and the very last Radio UCAN workshop. A tactile art workshop also accompanied a new exhibition of tactile art works and drawings created by visually impaired young people and their friends from South Wales. At lunch time we had a very special performance from the Inner Vision Orchestra, which was organised by Lloyd Coleman; the chairman of our Young People’s Steering Committee and presented by Baluji Shrivastav. Lloyd accompanied the orchestra playing Clarinet and together with Baluji, a special music workshop took place after the performance. We would like to again say a big thank you to the festival’s main funder Legal & General; Arts & Kids Cymru for funding our tactile art project ‘Tactiles’; Wales Millennium Centre for hosting the festival; and to everyone who participated, the UCAN Lead team, our trainers & all of our lovely volunteers. All photographs taken by Heather Winstanley. Thanks Heather!